Realme is set to announces a slew of devices on November 29. Breakthrough smartphone brand, Realme, announces entry date to the Philippine market. The brand will officially be a player in the local smartphone scene on November 29, 2018. Realme is a fast-emerging smartphone brand in Southeast Asia due to its frenzied appeal to the younger demographics by integrating technology and style. Realme achieved big numbers by selling more than 4 million smartphones in just three months since its inception in India. It's just half a year old, and it's now expanding its reach in Indonesia, Malaysia, Thailand, Vietnam and the Philippines. Realme has launched 4 smartphones in its portfolio. The brand is one of the highest-rated in Amazon India, and it has even broken sales records in India's biggest ecommerce platform, Flipkart. It has become the fastest brand to reach one million sales. The brand's "R" logo is dubbed as the “Realme Yellow” designed by Eddie Opara, partner and chief designer of world-renowned design consultancy Pentagram, is an artistic and impactful representation of both the Realme brand identity and its vision of being Proud to be Young, which the brand hopes will become a symbol of youth culture around the world. Additionally, the same designer is the leader who created innovative logos such as the brand identity change of Mastercard, Tiffany & Co., Windows 8 and MIT media lab. Realme Philippines is set to unveil full information of its product lineup on November 29th, 2018. Customers are invited to join the Realme official social media pages via Facebook, Instagram, Twitter, and YouTube to be updated with the latest offerings from the much anticipated brand. Stay tuned. 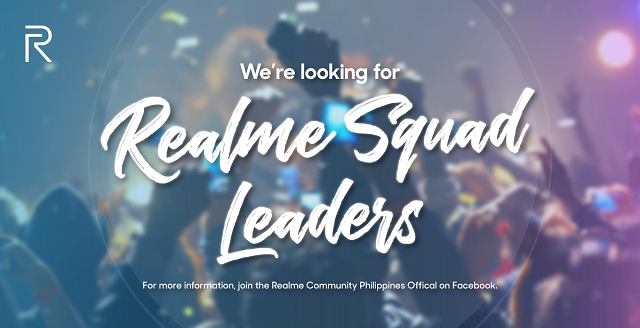 Realme is also looking for Realme Squad Leaders. The Realme Philippines community also named as the Realme Squad is now on the look for avid tech enthusiasts with passion towards technology to become Realme Squad Leaders. More than just providing information to co-community members, squad leaders will have the benefit of experiencing first the latest Realme devices and even propose their own community activities to be the pioneer of the brand.